Note: This article is part of an on-going series about Jim, a fun-loving but financially-disastrous friend. Let’s see what adventure he has in store today. Shortly after my return from Greece, I found myself sorting through the massive stack of snail mail that had amassed since my departure. At least 80% of it turned out to be junk, but a letter from a local credit union caught my eye. As it turns out, the local credit union was running a “back to school” special by offering a $50 sign-up bonus to anyone who brought in the letter and opened a free checking account with at least a $100 deposit. “OK, I’ll bite.” I thought. I’ve never been a member of a credit union before, so this should be interesting. A few days later my wife and I drove to Target, and since the credit union was only a block away, I decided to walk there while my wife picked up a few necessities, like tofu, soy cheese, and bananas. Anyway, I kissed my wife good-bye and started sauntering toward the credit union. Lo and behold, guess who pulled up next to me, asking if I need a ride? It’s Jim, our lovable soon-to-be bankrupt man! Jim: Hey man! What are you doin’ out here? You need a ride or sumthin’? No, Jim, but thanks anyway. After explaining where I was heading (and flashing the letter with the $50 bonus offer), Jim looked startled and amazed. While he gawked, I couldn’t help but notice a 24-pack of beer in the passenger seat next to him. Jim: Holy crap, man! Where can I get one of those letters? I should go home and check my mail, too! Hey, I sure could use some money like that right about now, ya know? Uh oh. Just hearing him say that makes me cringe. Jim, what kind of trouble have you gotten yourself into lately? Jim: It’s just not fair, man. My student worker job was postponed until fall semester starts at the University, so I’ve been out of work all summer. Times have been tough, man. Real tough. Heck, I just had to go get a payday loan so I can buy groceries and food for my two dogs! It’s alright, though. It’s only a two-week loan, and my student loan check should be arriving soon! Oh. My. God. Now it was my turn to stand agape. Picking my jaw up from the pavement, I muttered… something. I still don’t remember what I said. Seeing my perplexity, Jim tried to comfort me. Jim: Hey, it’s alright, dude. Like I said, it’s only a two-week loan. Classes start in a couple weeks, and I’ll have my job back. Oh yeah, and once my student loan check arrives, it’s smooth sailing! We made some parting words, and I wished him well, then continued my saunter toward the credit union doors. In disbelief, I mulled over the disparity between us. Like Jim, I’m also a student, and my salary is pathetically (nay, humorously!) low. We probably make about the same amount of money. Yet, here I am on my way to screw a credit union out of $50, and Jim is taking out a payday loan to buy beer! Setting aside some cash every month into an emergency fund, just for situations like this. Getting another part-time job over the summer. Heck, he knew his student worker job would not be available from May until August! A combination of the above, plus the possibility of making purchases on a credit card and making minimum payments for a couple months. I don’t advocate minimum credit payments, but they’re better than payday loans! Plus, Jim is planning to cover his payday loan debt with student loan money! Shock and horror! Student loans are a necessary evil for many people, but I don’t think Jim is using them for their intended purpose. No doubt he will also blow any excess loan money on extraneous purchases, such as a Nintendo Wii or a few more guitars. 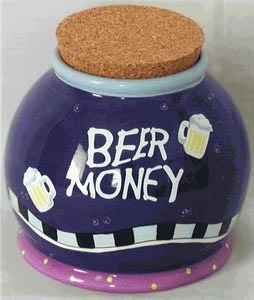 Or maybe he will just buy more beer with it. Just for the record, the local credit union gave me the $50 bonus without hassle. The rules for the bonus stated that the account had to be open for 90 days before the bonus would credit, but I struck up such a conversation with the guy that he went ahead and credited my account upon opening! I suppose he could tell that I was just there for the bonus.